NEW FOR APRIL 2006 - Spacious, architect designed, deluxe 3 bedroom duplex apartment with shared pools. Fully furnished to an excellent standard, with all home comforts, air-conditioning and balcony/terrace to all rooms, and wonderful mountain views. Mini-Market ● Restaurant ● Pub ● Pool Bar & Snack Bar ● Further Communal Outdoor Pools (inc. Children�s Pool) ● Jacuzzi ● Large Heated Indoor Pool ● Cr�che and Children's Playground ● Mini-golf ● Fitness Centre ● Sauna ● Floodlit Tennis Court. Set in breathtaking countryside, the development, (with a 10 minute bus service on hand), is close to the bustling harbour town of Fethiye, and the famous Mediterranean beach resorts of �l�deniz, the Blue Lagoon and Calis, with their many restaurants and amenities. Transfer time only 40 minutes from Dalaman airport. FETHIYE - only 12kms from Yaniklar, is a bustling traditional Turkish town, with plenty of atmosphere and ambience. In Fethiye you can stroll the beautiful marina, take boat trips, (including day trips to Rhodes), shop abundantly, eat in a huge selection of restaurants, drink in the many bars and dance the night away. There is also a huge market each Tuesday in Fethiye that sells everything from leather goods, clothes, spices and food all at bargain prices. SAKLIKENT GORGE - This spectacular 18 km. gorge is cut into the Akdaglar mountain. The gorge is totally shaded, so makes a good destination on a boiling hot day. OLUDENIZ (BLUE LAGOON) - This is the famous beach and blue lagoon that features on every travel poster of Turkey. The long, sandy beach is really spectacular and it shelters the lagoon from the sea. KELEBEK (BUTTERFLY VALLEY) - This valley is named after the hundreds of Jersey Tiger Moths that live in the limestone canyon every summer. From the beach you can climb up the stunning waterfalls of the national park. KAYA KOY (KAYA GHOST TOWN) - Kaya K�y� is a deserted ghost town & is still covered with the ghostly ruins of 1500 cottages. Best time to go is late afternoon when it starts to get cooler, and the mass tourists have left - take some drinks and watch the sunset from the top of the hill - it�s an eerie haunting feeling as the sun begins to set. Kitchen/Diner - Open plan kitchen/diner adjoining the living room. 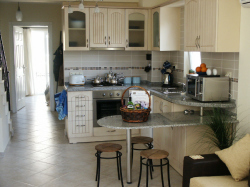 Fully equipped with oven, hob, microwave, dishwasher, large fridge/freezer, toaster, kettle, iron/ironing board, breakfast bar & stools. Terrace	- large patio area with built-in barbeque, patio table & chairs, power outlet and outdoor lighting. Retractable washing line also fitted. 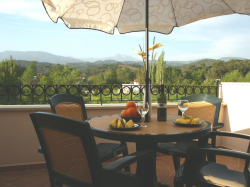 Open views to mountains and countryside, and the communal pools, (inc. children�s pool), for added peace of mind. Bedroom 1 (twin) - with air-conditioning, twin beds with bedside cabinet, chest of drawers with large mirror, small balcony (with outside light) overlooking Oasis Complex. Bedroom 2 (double) - with air-conditioning, double bed, triple wardrobe with full-length mirror, small balcony (with outside light) overlooking Oasis complex. Bathroom - With bath & shower unit, toilet and washbasin. Hall - coat rack, storage cupboard � containing a selection of games, tennis rackets, football, etc. Bedroom 3 (Double) - with air-conditioning, king size bed, bed-side tables, double wardrobe with full length mirror, Chest of Drawers, en-suite bath/shower room. Utility Area - washing machine and large clothes airer. Terrace 1 - to rear of apartment overlooking the Oasis complex with partial views to Eren Mountains. With 2 sun-loungers & small table � (all day sun, so perfect for that all over tan). Terrace 2 - to the front of the apartment, with spectacular mountain/countryside views. Patio table with brolly and chairs. Perfect for breakfast, or a glass of wine in the evening. WELCOME PACK:	Complimentary wine, tea, coffee, water, coke & snacks. Bedding and towels included, - (towels for use within the apartment only). The APARTMENT is NON-SMOKING to aid in the comfort of our guests and to minimise the risk of fire. If you are a smoker then please ensure that this activity is confined to outside the apartment.